In handing out accolades to RAF aircraft of World War II, history was most generous to the Spitfire, Mosquito and Lancaster. The poor old Hurricane, which bore most of the burden in the Battle of Britain, at least scores a place in the minds of most aircraft fans. But plenty of other planes did their bit in that great conflict. One of these was the Hawker Typhoon - one of the most successful ground attack aircraft of the war. Their efforts were even singled out by General Eisenhower himself. It came into service a few years into the war and wasn't promising. The new Fw-190 turned around the Typhoon's fortunes, though, because the Typhoon was the only thing that could catch the -190 at low level. Later the Typhoon specialised in ground attack. On D-Day there were 26 operational squadrons. By October 1945 they were all out of RAF service. One survives today at the RAF Museum in Hendon, London. I'm reviewing this kit just as I built it - literally straight out of the box. You'll see better models of the Typhoon around, for sure. But this is what it looks like out of the box, b rush-painted, with no extra work at all (I didn't even use putty). 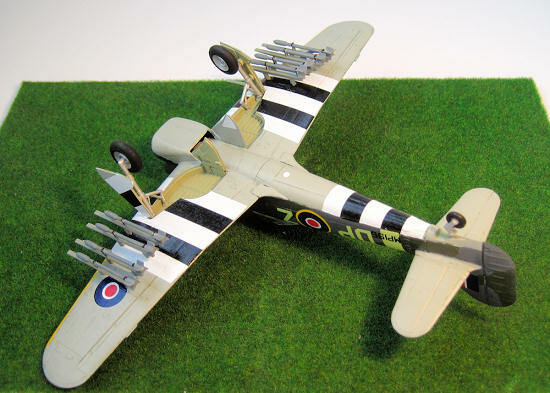 This is another in the great HobbyBoss line of simple WW2 aeroplane kits. These are simplicity in a box. Yes, the detail is also simple. No, there usually isn't much cockpit detail. But they (usually) look like their subject, they usually have two decal options, they usually go together easily, and they are always cheap. 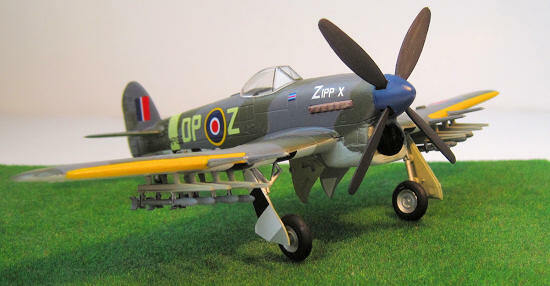 This one is similar to the 9 others I have already built (Zero, Mig 3 Spitfire Vb, Hurricane II, Hellcat, Corsair, FW190, Me 262 and P-47). Of those, only the Spitfire Vb is no good - its canopy just really looks no good. Like the Spit and all the others, though, the Typhoon has nice engraved panel detail, every bit as good as recent kits by other brands (and miles ahead of most Airfix and Heller kits). The cockpit and undercarriage are where the detail is simplified. The cockpit is nothing more than a generic seat and stick. Undercarriage doors are pretty thick although the legs and wheels are not too bad. You have the option of a 3 or 4 bladed propeller. The kit also gives you 8 rockets, each attached to its launching pylon. The canopy is nice and clear though it seems to be missing framework on the sides - nothing a stroke of paint won't fix. These kits have very few parts. The entire wing and bottom part of the fuselage is one piece, and it clicks neatly into place with the rest of the fuselage which is another solid piece. You can get your paintbrushes into the very basic cockpit and, if you want, you can try to insert more detail there. I have the feeling though that people who want a detailed cockpit in their plane are going to want to go for another kit. It's a lot easier to build in the detail before the fuselage halves are joined together. To do that, you'll need a kit that actually has fuselage halves. All the other parts fit very well. Pop on the tailplanes, and your airframe is basically done. The main undercarriage goes snugly into its locating holes. A little work was needed getting the rocket launcher rails into their holes (which I did after painting and decaling). The propeller is cool - it comes with a tiny steel rod so you can spin it, and remove it, without risking it falling off of its own accord. All such kits should be like that (though none of the HobbyBoss ones I've built have been that way). You'll need a quick swipe with sand paper across the top of the engine, where there is a fairly prominent, though thin, seam line. The very clear canopy fits very well. It does in fact have tiny frame lines moulded on it but you can hardly see them. I painted these freehand but probably left them a little thin. This one comes with two decal options for green and grey painted Typhoons. The first is apparently from No. 193 Squadron in August 44 and includes decals for the invasion stripes (no masking - hooray). The second is apparently from No. 245 Squadron in April 45. It has no stripes but has a sharks mouth. I say apparently because Hobby Boss is not renowned for the fidelity of its markings. I wouldn't know one way or the other and I suspect if you are keen on getting your Typhoon exactly right, you might plump for another brand. For the weekend build or the person who, like me, just enjoys the occasional warbird, I think this kit is great. Paint instructions are for Mr Hobby Mr Color which incidentally, along with Tamiya, are the easiest paints to acquire in where I live. I understand Mr Hobby is less widely available elsewhere. I had the right ones so I used Mr Color 330 Dark Green and Mr Color 331 Dark Sea Gray. The decals were as easy to use as all HobbyBoss decals I've ever used. A simple HobbyBoss kit of a less commonly seen WW2 aeroplane. 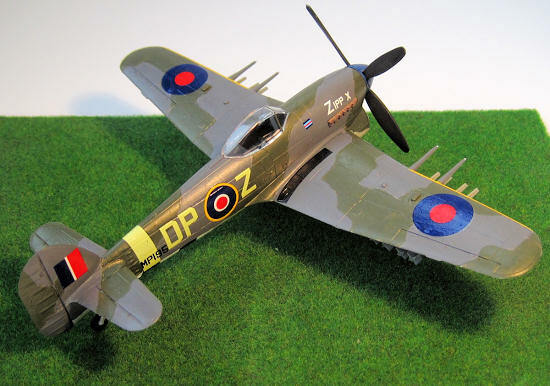 Recommended if you go into it knowing what it is - a straightforward kit for a clean, fun and fast build that will look like a Typhoon without being a showstopper or museum piece. Simple enough for anyone from beginner up.